Friends may come and go, but families are forever. I remember my dad saying this to me as a child and though I didn’t understand back then, I do now more than ever. My family has always been a big part of my life. I remember holiday dinners where my mom, aunt and Grandma June would prepare the meal. My dad and uncle would take us kids for a ride on the snowmobiles. I will always cherish those memories. I hope to instill the same belief about the importance of family in my girls too. Looking at photos are a perfect way to remember the good times and the people we love. I have a whole bookcase full of photo albums as well as over 100 albums on my personal Facebook profile. I often will spend a few hours just looking at pictures of times past. I also enjoy sharing this experience with my daughters. They enjoy seeing pictures of themselves when they were little and seeing what mom did before they were born. One fun and easy way for you to spend quality time with your family this holiday season is by creating a Family Photo Album. It’s a bonding experience and one that will create a memory in itself too! 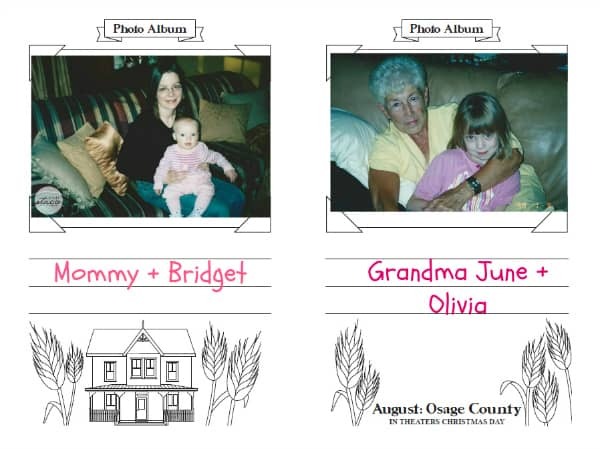 I’ve got a free Family Photo Album printable to share. 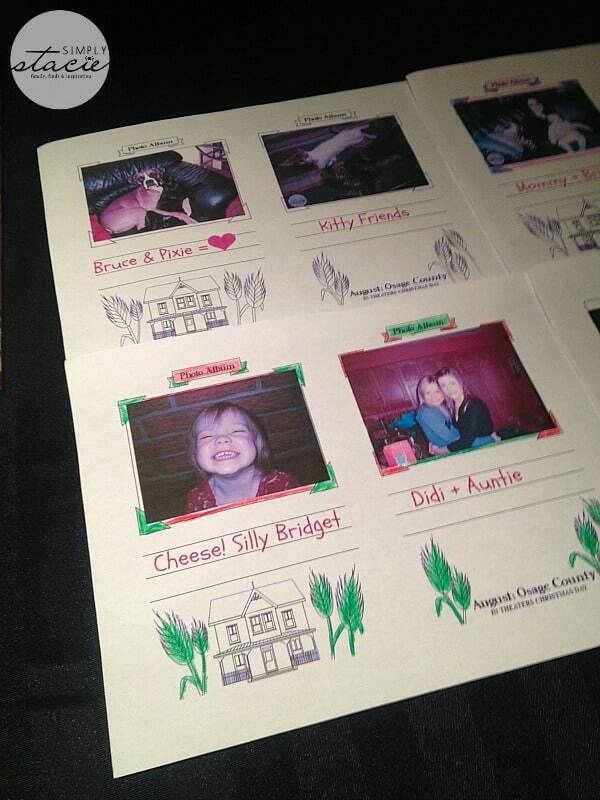 Print it out and add your photos and the kids can decorate it with crayons, markers and stickers. 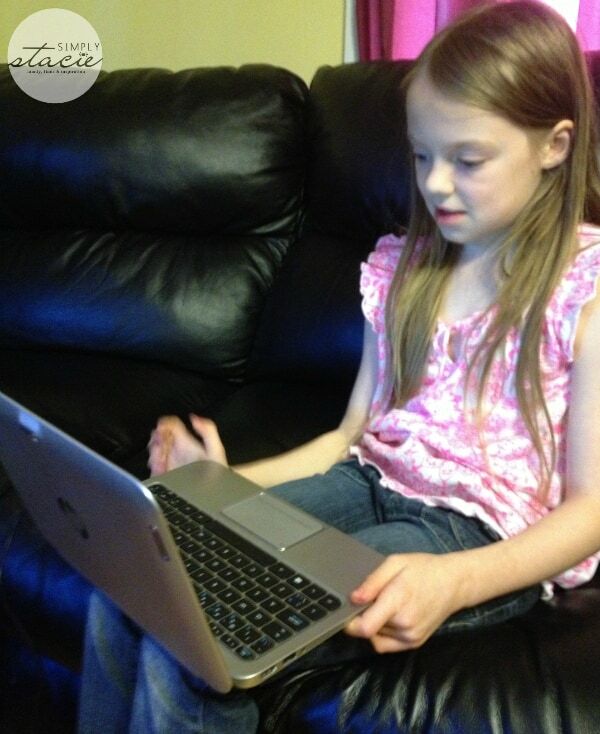 You could also let the kids pick out pictures off your computer or device and create a digital album using Paint or Picmonkey. I have most of my recent photos in a digital format so that way was easiest for us. I made the printable pdf file into a png file so that I could use it in Picmonkey. Then it was just a matter of adding the images as overlays, adding some text and printing them off. The kids can still colour and decorate the pages and be as creative as they like. 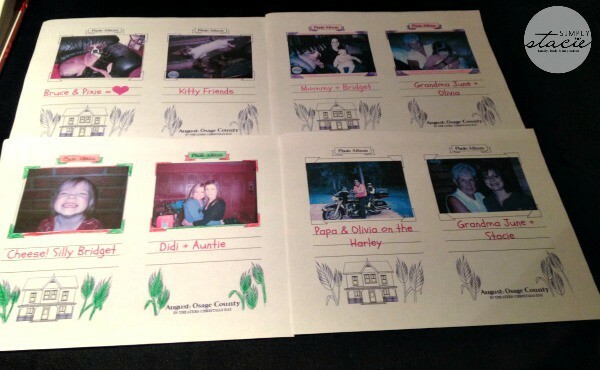 You could also do it another way by gluing or taping on photos from your albums at home. Whatever is easiest for you! Looking at these photos bring back so many wonderful memories. My girls loved their Grandma June. She passed away a year ago this month. This album helped to keep her memory alive in their hearts. She’ll always be in mine no matter what. We printed them out and after they are properly decorated, we’ll fold them down the middle and make them into a booklet for my daughter to keep. There’s a movie premiering on December 25th in select cities (and everywhere in January) that I’m looking forward to seeing. It’s called August: Osage County and it has an all-star cast including some of my faves like Meryl Streep, Julia Roberts and Juliette Lewis. 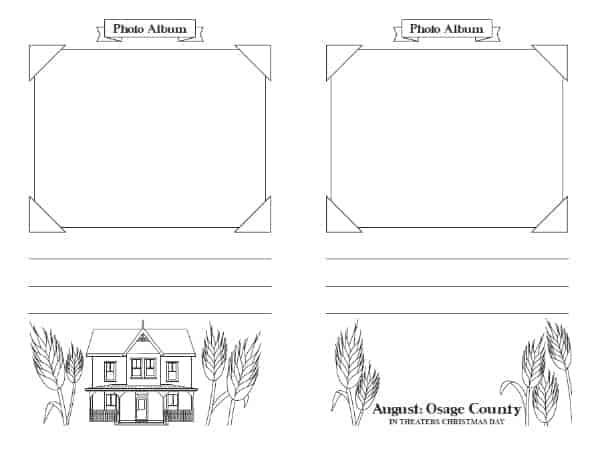 August: Osage County tells the dark, hilarious and deeply touching story of the strong-willed women of the Weston family, whose lives have diverged until a family crisis brings them back to the Midwest house they grew up in, and to the dysfunctional woman who raised them. After making its Broadway debut in December 2007 and premiering at Chicago’s legendary Steppenwolf Theatre, it continued with a successful international run. The Weinstein Co. has teamed up with has teamed up with MyHeritage.com for the release of August: Osage County to help you learn more about the Weston family and your own family with a free premium membership! You can also check out the Discover Your Roots Facebook app for a chance to enter the sweepstakes to win weekly prizes and a grand prize! 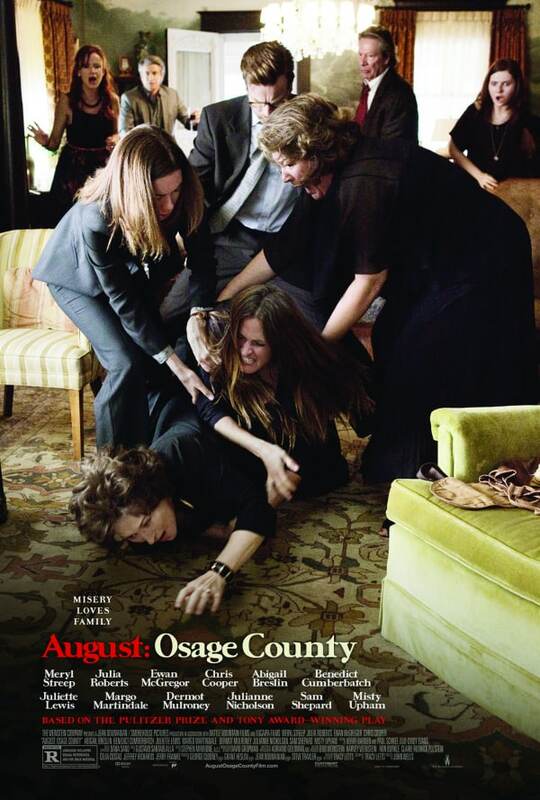 Visit August: Osage County website to watch the trailer, meet the characters and learn more about the film. It looks like my kind of movie and I can’t wait to see it! A few months ago I met my newborn niece and my whole family was there, it was wonderful! Driving out of state with the kids to surprise my mom and grandma for Christmas many years ago is one of my favorite family moments. Surprising my husband’s parents with a cross country visit for Christmas, 2 years ago! If I could go back, I’d spend more time cooking with her. Going to Hawaii with my family. Many years ago when I was in college I surprised my family during Christmas. They thought I wasn’t coming. My grandma’s face was priceless. I miss her. We got alot of our extended family together for Thanksgiving. It was great seeing people we hadn’t seen since we were little. My last Thanksgiving when my grandmother was alive and it was spent with the entire family at her house. My son passing presents out to everyone at a Christmas party! Every year on Christmas Eve we get a new pair of pajamas. Lots of good memories for me. The day I was married was great and the birth of my 3 children was and then the births of my 3 grandchildren. They are all great memories for me. Thanks for this contest. One of my memories is being snowed in with my daughter and playing board games all weekend. We had a great time. I have fond memories of my mom baking pies and cakes during the holidays. I was on fall break in college and my sister took me to Underground Atlanta. I remember the last time we had a huge family gathering! Christmas Eve we traveled to my Great Gramma’s log cabin to be with the family. Christmas Eve Dinner at my precious Grandmother’s house! She got the whole family together all at the same time once every year. The food and fellowship was unforgettable! The memories of me doing the holiday baking with my family… just priceless! A few years ago I was thrilled to have my kids and grandkids all together for Christmas at my house. They live so far away and this was a treat for me. Thanks for the giveaway…we were living in NH when our daughter was very young and one Christmas she became very upset when she realized that the snowman we had built with her in the front yard would eventually melt.